Congratulations to you and thank you so much for entrusting me to capture your new baby in his or her first few days of life. I am truly honored to be able to capture this time for you, and I look forward to getting to know you and your sweet baby! 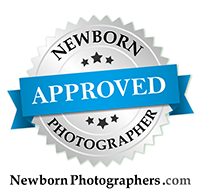 This newborn session guide will help you prepare for your newborn session. This guide is a lot to read, but please do take the time to read it carefully. If you follow the instructions, the session will really go smoothly. Do not change the baby’s diet the day before or during the session. Continue to feed your baby how you normally do (breast-feed, formula-feed, or both). Bring plenty of bottles! Your baby will need to eat more often during the session than they normally do. Do not make any sudden changes to the baby’s diet (or your diet) that may contribute to fussiness. Clean away baby’s flaky skin and eye boogies with a warm wash cloth. Trim those tiny fingernails and toenails with baby trimmers. If your baby has any band-aids on the foot, thigh, etc., please remove them as soon as you possibly can to allow any imprint marks to disappear. Before the shoot, do your best to keep baby awake for 1-2 hours. Try giving a bath, let baby kick with only a diaper on, tickle their toes, and let them fuss for a little bit (no pacifiers) for a few hours beforehand. Recruit your spouse or family to help you with these tasks. Just prior to leaving for the studio, plan on giving baby a full feeding. Dress baby in loose fitting clothing to avoid any lines on their skin. A simple front button sleeper is best. Avoid anything that will have to be removed over the baby’s head. Bring a pacifier. This can really help during the session. Super important - please bring baby into the studio in their car seat. Taking baby out sometimes wakes them and gets them very alert. I will take baby out of the car seat once you’re in the studio and everyone has settled in. I have my trick on getting them out without waking them. Be patient. If your baby is fussy or alert, do not stress out. Babies can sense your anxiety and we want to keep the environment as calm and peaceful as possible. We will take breaks as needed. Be prepared for messes. There can often be pee, poo and spit up happening during a session. I’m prepared for this, and it happens quite often. I will be dressed in comfy sweats as I work and you (if you want to be in the photos with your newborn) might want to bring an extra set of clothing, just in case. Sessions can take up to 3 hours. We provide light refreshments for the parents, but do bring plenty of snacks for yourself and for siblings. There are a few food establishments in our parking lot, and you can feel free to send your spouse or family member to grab something and bring it back to the studio! Photographing the connection between you and your baby is one of my favorite things to capture. Images will be snuggly and close, showing your bond. 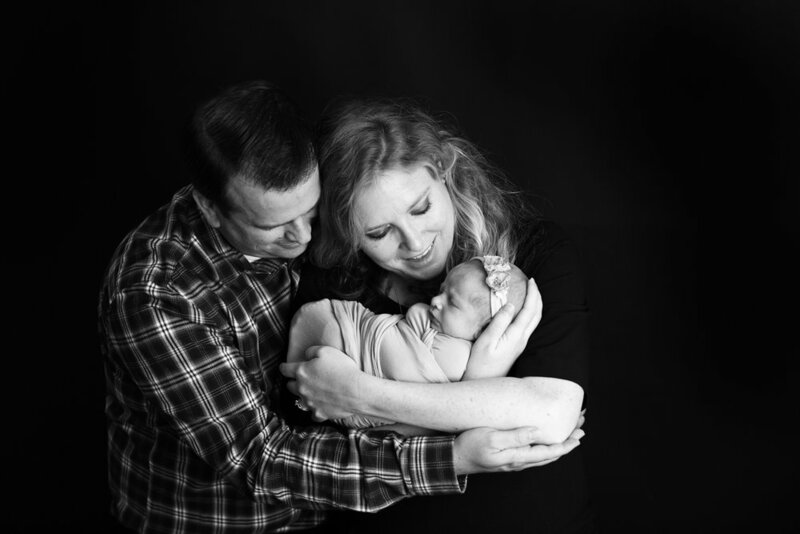 I love to capture the family together, mom and baby as well as dad and baby. Mom: I do suggest either having hair & makeup done for the session, or doing it yourself, heavier than you normally wear it. Neutral tones and soft application is best. I have a variety of wraps and gowns in the studio, but you are welcome to wear your own tops. I suggest neutral colors with little or no patterns. Be sure your nails are tidy and clean as your hands will make their way into the images. Nail polish is ok, just make sure that it is fresh and not chipped. I aim to photograph using the most flattering angles and lighting to bring out the natural beauty in you and your family. Dad: Be freshly shaved and avoid bumps and redness. Trim your beard, sideburns, mustache or goatee. Look especially for wiry stray hairs. Make sure your nails are clean and trimmed. V-neck or button up shirts look great, with nice jeans. Shirtless is an option as well. Please do not wear any shirts with logos or writing on it. Including older siblings in your newborn’s portrait is the perfect way to document your new addition to the family. Get those kiddos cleaned up before the session - clean nails, clean hair, clean feet, clean teeth, and wipe away snotty noses. The cleaner the child, the better their photos will turn out. If your child is still taking naps, make sure they rest before the shoot. Bring cereal, snacks or candies that won’t stain their teeth. These can be used for a little bribery if needed. Do not let them eat or drink anything before the session that will stain their cheeks, mouths or teeth. Sister(s): Please wear a snug-fitting tank or top in a neutral color. Ivory is my favorite. Your older daughter’s hair should be natural and worn down. Bring any clips and accessories that you’d like and we can decide hair styling once you arrive. Brother(s): A snug pair of jeans and a neutral colored shirt is best. Avoid any shirts with patterns, bright colors or writing on the shirt. Due to the duration of the newborn session, I recommend bringing young children into the studio either the first 30 minutes of the shoot, or the last 30 minutes of the shoot. I do ask that you arrange to have them leave the studio once we’re done with family pictures. Sitting in our smallish studio for 2-3 hours, is too long for little ones. I love siblings, but toddlers and younger children can sometimes disrupt the environment in the studio necessary for a successful newborn session.